After a sluggish start, Jonathan Toews and the Chicago Blackhawks stormed back late with a rapid-fire rally to strengthen their grip on first place in the Central Division — and the Western Conference. Toews scored twice and Richard Panik and Artemi Panarin each had a goal in a span of 3:02 in the third period to erase Colorado's two-goal lead and send the Blackhawks past the Avalanche 6-3 on Sunday night for their fifth straight win. Patrick Kane scored his team-leading 32nd goal and Marcus Kruger added an empty-netter for Chicago, which won for the 17th time in its last 20 games to pull seven points ahead of slumping second-place Minnesota in the Central Division. The Wild dropped their fifth straight, 5-4 to Winnipeg on Sunday. The victory, combined with Los Angeles' 5-2 loss at Calgary on Sunday night, clinched Chicago's ninth straight playoff berth. "Once we got that first (goal), things just started clicking for us," said Toews, who scored his 19th and 20th goals to give him 20 or more in each of his 10 NHL seasons. "I think we all collectively made that decision, that we had to play better and were looking for that first bounce, and maybe we could put some pressure on them." And the Blackhawks turned it up in a hurry. 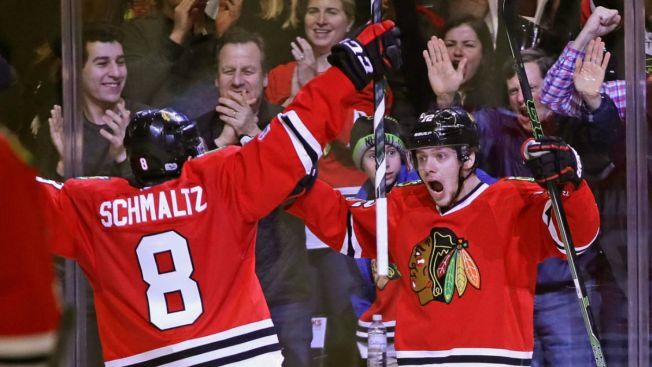 With Chicago trailing 3-1, Toews tipped in a bouncing shot at 10:17 of the third period to cut it to 3-2. "In the third period, we got one, and all of a sudden got a lot more comfortable in the scoring areas," coach Joel Quenneville said. "Definitely changed the whole complexion when we got the first one." Toews' first goal withstood a video review that showed the Chicago captain may have been offside. He was trying to exit the Colorado zone and tag up at the blue line before Panik — who was skating into the Avalanche end — caught up with a puck that had just crossed the line and was inches ahead of his stick. "I thought it was the right call. It's not offside, doesn't trigger the offside until he touches the puck," Quenneville said. "You could say it was a tie." Avalanche coach Jared Bednar was left a bit confused. "I guess I don't fully understand it," Bednar said. "It's a tag-up rule. They're saying it wasn't fully on (Panik's) stick. Bednar was more upset about what followed. "That give them a little life," Bednar said. "It's what we do after that that bothers me. "That was one of the top teams in the league turning it up a notch and feeling it, and their top guys making plays and our guys making mistakes." Panik rifled in a loose puck from the slot 17 seconds later to tie it at 3. Panarin put Chicago ahead 4-3 just 17 seconds after that on a shot from the right circle that deflected in off the shoulder of Colorado goalie Jeremy Smith. Toews stretched it to 5-3 with his 20th on a wrist shot from the left circle with 6:41 to go. Mikhail Grigorenko scored twice and Sven Andrighetto had a goal for the last-place Avalanche. Chicago backup Scott Darling stopped 22 shots to extend his winning streak to six games. The 27-year-old Smith made 28 saves in his seventh NHL appearance and sixth start. His only win was on Feb. 25 when Colorado beat Buffalo 5-3. Grigorenko, a scratch in Detroit on Saturday, ended an eight-game drought with his eighth and ninth goals. Andrighetto, acquired from Montreal at the NHL trade deadline, scored his second goal in eight games with the Avalanche. Kane opened the scoring 4:33, ripping a feed from Panarin past Smith high on the stick side to complete a 2-on-1 break. Grigorenko tied it at 1 at 8:14 when he fooled Darling from a scramble in front with a low shot to the lower right corner. The 22-year-old Grigorenko struck again with 3:24 left in the period to make it 2-1. He backed in Brent Seabrook as he moved in 1-on-1 against the veteran defenseman, then popped an off-balance shot that clanked off the right post and in. Darling made a point-blank pad stop on Mikko Rantanen with 7:05 left in the second, then a close-in glove save on Joe Colborne about two minutes later to keep the margin at one goal. But with 3:35 left the period, Andrighetto cut across the crease unchecked in front of Chicago defensemen Trevor van Riemsdyk and Brian Campbell and neatly tipped Mark Barberio's drive over Darling's glove to increase Colorado's lead to 3-1.